Pennsylvania State Senate Majority Leader Jake Corman addresses members of the Chamber of Business and Industry of Centre County during a recent luncheon at The Nittany Lion Inn. 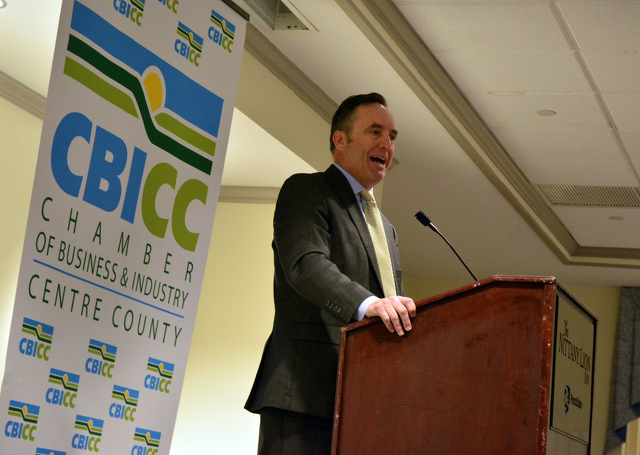 STATE COLLEGE — Pennsylvania State Senate Majority Leader Jake Corman, R-Bellefonte, mentioned his children as he brought up school safety and other issues during a Chamber of Business and Industry of Centre County luncheon held April 9 at the Nittany Lion Inn. Corman said he is concerned about schools and hopes the state can develop a plan to help keep them safe from active shooters. He said he feels that it should be up to each district how they plan to keep students safe, whether that be with armed guards or other methods. “As a father of three, watching what happened in Lakeland, Fla., scares the crap out of me, and just because it hasn't happened here doesn’t mean that it can't,” said Corman. “Schools are soft targets. We want to be proactive and give them tools to identify children at risk who may cause a problem. And, I think we need to give the schools and law enforcement more tools in order to do that. He said he hopes to allow schools the options they need in order to keep the students safe. He said he would leave it up to schools on whether that would mean have guns in the school as protective measure because every school in different. Corman said schools like State College have police departments right down the road, so they may not need to have armed personal. But, for rural schools that are far from any police presence, Corman said he would like to allow those districts the choice to decide what they need to do to keep students safe. He said it also is important to find ways to identify ways to identify any red flags that may come up with students in order to get to them before they carry out a potential attack. “If there are resources we can give them, experts that we can bring in to help them develop a security plan for an active shooter, then we should do that,” said Corman. In his speech, Corman said he is hopeful that the anti-hazing legislation will pass in the Senate in the upcoming weeks after passing in the House recently. “As a parent you can only imagine getting that phone call after dropping your son off at college, excited about their future and then getting a call about that tragic incident and just the pure tragedy, unnecessary tragedy that it was,” said Corman. Corman said Timothy J. Piazza's family approached him about the bill, and that they took a position that tried to include Penn State, the police and the family in order to make a bill that would help prevent a similar tragedy from happening again. He said one concern was that the current law does not always allow for change that is congruent with the potential tragic result from hazing. Corman said currently there is only a misdemeanor charge for hazing, even if the hazing leads to a significant outcome. He said in the Piazza case, charging the fraternity members with involuntary manslaughter did not match up with happened, so the new law hopes to provide a new option for prosecutors in such instances. “The new law we introduced will allow more flexibility within the prosecution, allowing anything to a summary offense if it is a minor incident that still needs to be addressed, but if the hazing does end in significant bodily harm or in death then it can come up to a felony. Hopefully, moving forward, that will provide the proper deterrents,” said Corman. He said that even on the Penn State campus there have been hazing incidents since Piazza died Feb. 4, 2017, and he hopes the bill can move the Greek community past hazing. Corman said he believe that fraternities and societies have a place on campuses due to the social interactions they provide and the positive things they can do for the community, but the Greek community need to evolve into a place where young people are not being put at risk. Corman also spoke at length about the redistricting that has occurred in the state congressional districts for the upcoming elections. He said efforts to fight the redistricting done by the state Supreme Court in order to end gerrymandering have failed and that the state will move forward with the line as is for the upcoming elections. Corman said he believes redistricting is good for the state, but was not pleased with the process that occurred when the new map was drawn for federal districts. He hopes the process to divide the state by congressional lines will be an independent process in the future, and not influenced by politics. The senator said he would potentially be on the commission to look at the state legislative maps in 2021 if he is reelected, but he would be glad to give that power up and allow an independent group to draw the maps. He said the plan to have an independent group draw the state lines will be brought to table soon. “I am all in. I am happy to allow an independent commission to do it. It is always tricky to find out what is independent, but I think there are ways to do it. Other states have moved forward that way, so we are hoping over the next couple of months to get some things passed. Corman also stressed compromise in order to get things done in the government and highlighted medical marijuana, pension reform and other things he has been able to compromise with Gov. Tom Wolf with in order to get things accomplished. Corman also touched on transportation infrastructure, and said the section of Route 322 from Potters Mills to Boalsburg is a safety concern that he feels needs to be addressed soon. He said he hopes to get the funding needed to improve that road. “You know, if I was a Penns Valley parent and I saw my kids get on that school bus twice a day on that highway it would make me nervous. It is a road with very poor sight lines and very little room for error, so anything we can do to add to that safety of that corridor is important,” said Corman. He added that yes that traffic on the road is bad during home football games at Penn State, but he is more concerned about the safety. He said he is working with the governor to get the funding to finish the project. Corman also cited the need to improve the interchange at Interstate 99 and Interstate 80. “The vision for I-99 was to take it up through Bedford all the way up to New York before it stalled here at the Bellefonte Interchange. Obviously, there is a lot of areas for improvement in order to get it all the way to New York, but the first is that interchange.” He said he is working with Congress to get the funding to improve the interchange and to get the project moving forward.